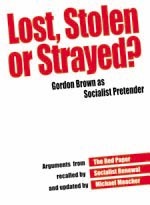 In 1975 Gordon Brown edited and published The Red Paper on Scotland - The Socialist Challenge. This was at one time required reading among the Scottish Left. Today, Gordon Brown might usefully be reminded of his youthful thoughts as his position since then has changed considerably.